How do you know a good mulch or soil before you buy it? Today’s garden mulches and soils are sophisticated blends of natural forest products, other organic materials and special additives. They can be very complex in order to meet the needs of both beginning and advanced home gardeners. Most often, you can’t tell a good product from a bad one just by its appearance. Even a lab test can’t tell you everything. That is why the Mulch & Soil Council developed a product certification program that tells the whole story...lab analysis and greenhouse growth testing. In 2003, the MSC launched its Product Certification Program. Products that pass the review and testing requirements and comply with ongoing audit testing of products in retail markets earn the badge of the MSC certification logo for their packaging. The MSC Product Certification Program was developed to help consumers, retailers, regulators and others identify products that conform to the Voluntary Uniform Product Guidelines for Horticultural Mulches, Growing Media and Landscape Soils (VUPG). These guidelines were developed over a five-year period of industry debate among Council members and non-members to define product nomenclature, uniform product characteristics, minimal performance objectives and proper labeling requirements to inform end users. The Mulch & Soil Council (formerly the National Bark & Soil Producers Association) is pleased to announce the only national product certification program for horticultural mulches, soils and horticultural growing media. The purpose of the certification program is to provide retailers and consumers with a means of determining which products conform to industry-accepted labeling and nomenclature — in short, which product labels truthfully describe the product being sold. Product Differentiation: In the commodity market that has developed for mulch and soils, certification is a means for quality manufacturers to set their products apart from poor quality, mislabeled products. Product Protection: Retailers and consumers often cannot tell good from poor products simply by appearance. Certification protects your product name from being identified with poor quality products. In environmentally sensitive times where we are all only one headline away from disaster, certification becomes the only hallmark available to identify quality mulches and soils to the buying public. Category Protection: Each certification category indicates a different level of value-added products. Certification helps you identify your value-added product lines and recover your value-added costs. Industry Marketing: The MSC has committed to promoting the quality of certified products to retail buyers and the consumer public. Your participation in the certification program identifies your products as preferred mulches and soils for the buying public. MSC is your best, independent means of demonstrating your commitment to quality production and control. Products must pass stringent screening at the time of application and will be subject to random field testing directly from the market place. To achieve public confidence, the standards must be kept. However, the fact that everyone does not presently meet the standards is exactly why certification will work and participants will prosper. We hope your company is one that is dedicated to growing the industry through quality products. Please review the enclosed materials and decide if you want to show your customers your commitment to giving them the value they seek. 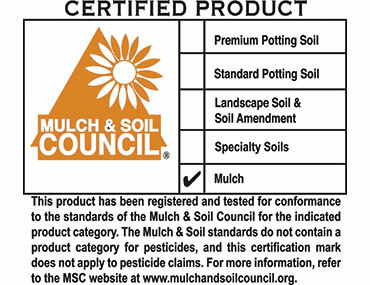 MSC Certification is a major step in any manufacturer's customer assurance that its product label is truthful, accurate and that product claims have been verified in an ongoing system of monitoring and evaluation to help users, resellers, regulators and others identify products that conform to the Voluntary Uniform Product Guidelines for Horticultural Mulches, Growing Media and Landscape Soils (VUPG). For Consumers: certification means that label claims for packaged products for non-commercial use are reviewed and verified by generally accepted industry criteria or independent research testing and what is ON the bag is what is IN the bag. For Retailers: certification means the product label has been reviewed for industry compliance, standardized nomenclature and tested for known potential contaminants. For Regulators: certification is an indication of companies that have willingly submitted their products to label and contents testing as a demonstration of their best efforts to comply with industry regulations. Information available from the Mulch & Soil Council (MSC) is provided for general information and reference purposes only. While the facts and statements made in the information are believed to be accurate when posted, the information is subject to change as new facts, materials or knowledge is received. The information is subject to change, at any time, without notice. (2) THAT MSC CANNOT AND DOES NOT GUARANTEE, WARRANT, ENDORSE, OR OTHERWISE MAKE REPRESENTATIONS WITH REGARD TO ANY PRODUCT’S SAFETY, PERFORMANCE OR RESULTS. USERS OF THE INFORAMTION PROVIDED BY MSC EXPRESSLY ACKNOWLEDGE AND AGREE THAT MSC IS NOT RESPONSIBLE FOR, AND EXPRESSLY DISCLAIMS, ANY AND ALL LIABILITY, COSTS (INCLUDING REASONABLE ATTORNEY’S FEES), OR DAMAGES, INCLUDING BUT NOT LIMITED TO DIRECT, INDIRECT, OR CONSEQUENTIAL DAMAGES ARISING OUT OF USE, REFERENCE TO, OR RELIANCE ON ANY CERTIFICATION INFORMATION OR GENERAL INFORMATION PROVIDED BY MSC. USERS WHO RELY ON THE INFORMATION PROVIDED BY MSC DO SO AT THEIR OWN RISK. (3) MULCH COLOR DURATION MAY VARY DUE TO WOOD SPECIES, ENVIRONMENTAL EXPOSURE AND/OR DECOMPOSITION RATES. MSC PRODUCT CERTIFICATION DOES NOT APPLY TO COLOR CLAIMS. FOLLOW MANUFCTURER INSTRUCTIONS TO MAXIMIZE COLOR RESULTS.